UNU-IAS organised the 2018 ProSPER.Net Leadership Programme under the theme “Leadership for Urban Sustainable Development” in Melbourne, Australia, from 12–16 November 2018. Ten participants from across the Asia-Pacific region took part in the programme, hosted this year by RMIT University. 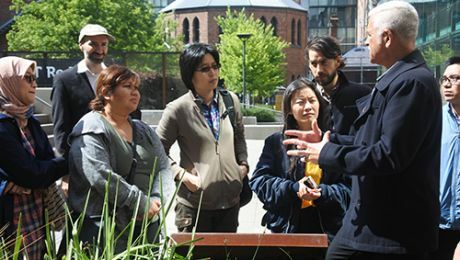 Participants from academia, civil society, and the public and private sectors came together to explore and learn about the challenges and opportunities in urban sustainable development. Participants were exposed to a range of interactive sessions, lectures, presentations, and group work, each with the common thread of incorporating sustainable development planning in the context of the New Urban Agenda as well as the Sustainable Development Goals (SDGs), with a focus on the city of Melbourne. A number of Sustainability Leadership exercises enabled participants to delve deeper into the characteristics and styles of leadership, as well as ethics and standards that are expected of leaders. 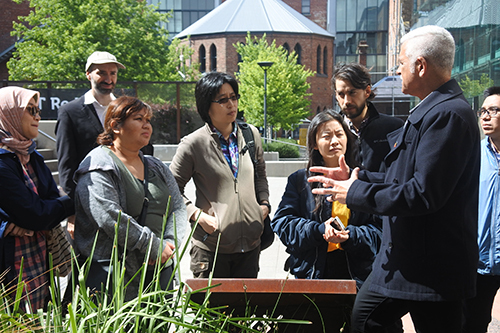 Participants also had the chance to see a successful example of sustainable housing in practice, with a field trip to the Nightingale housing complex. The programme ended with participants presenting strategies for the city of Melbourne in relation to achieving targets from SDG 11. These included gaps and prevention measures for the city’s waste management challenges; addressing unequal access to green and public spaces; strategies to address current housing issues of affordability, supply, and accessibility; and a people-centred approach to developing solutions for sustainable transport in Melbourne. Outcomes from the 2018 ProSPER.Net Leadership Programme can be accessed here.